Of all the grooming products on the market, are any of them quite as misunderstood as the straight razor? Whatever it is, the straight razor has an image problem. And that’s a real shame, as it is actually an incredibly useful tool when it comes to shaving and grooming. In this article we’re going to right a few wrongs, and tell you just why the straight razor could actually be the best razor design out there. Just in case we do convince you, we’ll also take a look at the best straight razors you money can buy. Buying a straight razor is not like any other purchase. To help you find the right razor for you, before we get to our actual reviews, in this first section we’ll highlight the features and design points that make each design unique. Remember them, and they will help you to find the right razor to suit your needs, as each feature will be more or less important depending on what you’re looking for and what you need in the right razor for you and your face. 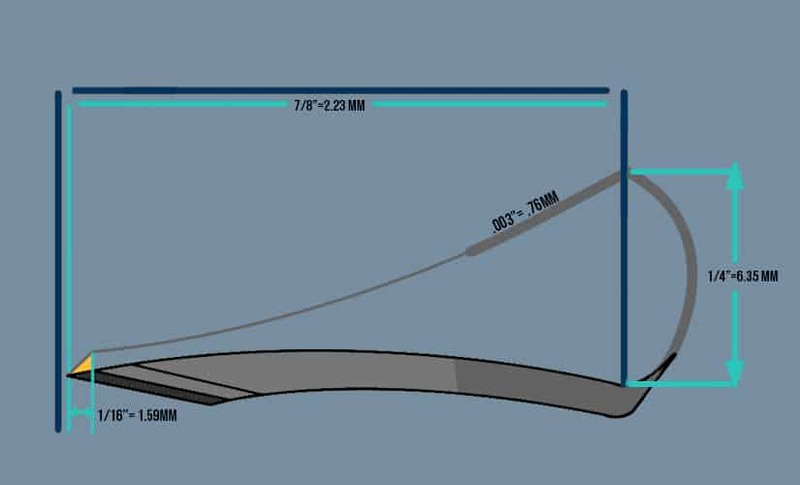 Blade width is going to come as either 5/8” or 7/8” and sometimes 8/8”. Spoiler alert there is only one 7/8” blade on the list below, and no 8/8” width blade at all. That kind of surprised us actually, as back in the day there was a much broader range of razor widths on the market. The trend these days seem to be that the 5/8” is the standard, and that does make sense. A 5/8” blade is a little shorter in terms of width. That means it is easier to manoeuvre around your face, and it is a blade that can get into the smaller parts of your face more easily. The little patch under your nose, for example, is easier to get to with a blade with a shorter 5/8” width. One of the big decisions to make is whether you want a traditional blade or a shavette straight razor. Both of them are bringing different advantages, and both can provide a good shave. You will find examples of both razors on our list below, so you can easily compare the two types. A traditional blade is exactly what you think it is. A razor blade on a hinge with a handle and a solid, very sharp blade. 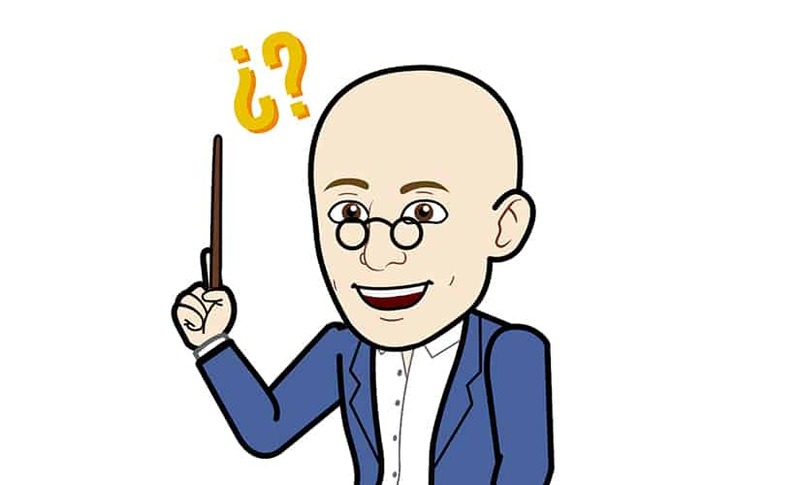 A shavette is more like a hybrid. It has the shape of a straight razor, but uses replaceable blades, just like safety razors. It may not give quite the same standard of shave but it does require far less maintenance. This is a very simple one! Do you want a traditional straight blade? Then get ready to drop about 150 bucks minimum. That sound like a lot of money? A shavette razor is more like 50 or 60 bucks maximum. That is why some people suggest that if you are new to straight razor shaving, try starting out with a shavette. Once you know this style of shaving is for you, invest the bucks to upgrade to a traditional cut-throat straight razor. Are you happy to hone your blade on a leather strap before every shave? If you are, then a straight razor is fine. If not, then a shavette razor with replaceable blades that don’t need honing or sharpening may be the better tool for you. Stainless steel is tougher and will need less sharpening over the lifespan of the blade. Carbon steel on the other hand can be ground to an incredibly sharp point. That makes it able to deliver an incredibly close shave. But it is unable to hold that blade edge for long, meaning it requires better honing and more occasional sharpening than a stainless steel model. Stainless steel is also cheaper, so you will find that almost all replaceable blades are made of stainless steel. Because of that, if you really want a premium carbon steel blade on your razor, then you will almost certainly need to be looking for a traditional style of razor. We’re going to kick off our list with a premium razor straight from a premium manufacturer. Ladies and Gents, hailing all the way from Sweden, please say hello to straight razor number one, from DOVO. Any man who wants a premium straight razor that’s ready to go straight out the box. Founded in Sweden way back in 1906, DOVO is a company who knows straight razors. So when they come out with a model and name it the “DOVO-Special,” then you have just got to sit up and take notice. This premium blade leaps out of the box packed with premium features – one of which is the fact it is delivered ready to shave straight out the box. No first grind or hone required here. You can open the packet with one hand whilst applying shaving cream with the other and be shaving two minutes after the box arrives. And what a shave you are going to get. This is a carbon steel razor blade folks. That means this product is built with just about the best blade material you are going to find on a straight razor. It is high temper too, which means less sharpening is required over the long, long lifespan of the blade. What DOVO has done is taken that quality material and applied it to a 5/8” sized blade with a rounded edge. That smaller size makes it ideal for getting into every nook and cranny on your face, whilst the rounded edge means you won’t accidently cut yourself whilst working the blade into tight angles. If we were to level one complaint, and you can bet your backside we will, then we’re not huge fans of the imitation tortoiseshell. Yeah, we know they can’t use the real thing anymore, and we respect that. But there are far nicer materials that feel better in the hand than imitation tortoiseshell, in our opinion at least. Still, it’s a small gripe against what is a quality razor. See the reviews on Amazon here. Next up we have another very impressive blade manufacturer. This one hails from Japan, and is bringing a very interesting razor blade to the market here. Any man looking for the best middle ground between a disposable razor and a quality barbers razor. Whilst we are big fans of straight razors here at PrimandPrep, we know they are not without their disadvantages too. Heck, if they weren’t, then no one would have invented the safety razor as a viable alternative for a super close shave. Whilst of course there is still a load of pros to a straight razor, having to hone the blade all the time is probably not one of them. 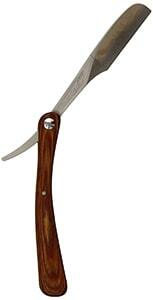 If that sounds like you, then maybe you should consider a shavette straight razor, like this one from Feather. This isn’t the only shavette style design we’ll look at today by the way, but this is certainly one of the most unique ones. Feather knows an awful lot about making super sharp razors and has been doing just that since 1932. This razor really benefits from that pedigree. Yes, it’s stainless steel, but since it is disposable that doesn’t matter so much. Each blade will come out the box perfectly sharpened by Feather, ready for you to pop onto the handle. Speaking of which, replacing the blades is very easy and a lot safer than some other shavette models. You simply pinch the blade out of the spring mounted housing to remove it. Snap a new blade into place with very little force required and away you go. The handle is coated with a silicone like substance. It feels really nice in the hand, and is also an excellent non-slip surface to minimize accidents during shaving. Of course the downside is that you are tied into buying replacement blades forever more. But when the best only cost about a quarter per blade, you’re hardly going to bankrupt yourself. Bottom line, if you want the quality shave of a straight razor matched with the ease of use of a disposable, then this could be the right razor for you. Check out the hundreds of reviews here on Amazon. Replaceable Blade – No Honing Required! Feather is back again (we told you they were good), with yet another straight razor that combines a top quality shave experience with a truly eye catching design. Any man looking for a razor that looks and feels incredible whilst delivering a superb shave. Oh, and it’s low maintenance too. What more can we say about Feather? They already took a starring role on our guide to safety razors and now they are threatening to run away with out straight razor guide too. It cannot be denied though that these guys make a quality razor. This next piece is another razor that uses disposable blades. So that means that, again, you don’t need to worry about honing or sharpening your blade, just take it out and replace it. As we already said above, Feather blades are of outstanding quality anyway, so you have no worries about the blade itself. But it is how this straight razor holds and deploys that cutting edge that truly impressed us. First of all, the blade locks in place with a simple but effective mechanism. This mechanism includes an internally mounted tension screw. This screw, such a tiny component, plays a huge role in this razor. It locks the blade with a solid horizontal force, making for a shavette that looks, feels and handles as good as any traditional straight razor. Speaking of feel, that teakwood handle has incredible ergonomics in the hand. It is clearly a quality construction, but is also highly practical. It’s non-slip in wet conditions for example, and has enough heat tolerance for the entire razor to be easily disinfected in boiling water. The handle also contributes to the excellent balance of the razor. It has been designed to operate with the blade and handle working in unity. That makes for a razor that just feels so intuitive in your hand, and gives you the confidence to really go for a close shave. It’s not cheap – not by a long shot! But for those men who are not put off by the high price, this razor represents an incredible investment that will pay you back many, many times over with close and professional quality shaves. See the consensus of the many Amazon reviews here. The next razor is a second entry for DOVO. Whilst the last two products have come with an innovative design, this is a back to basics model that is all about cutting power. Any man looking for a traditional straight razor design with the power to give the closest shave possible. We were going to kick off this review by diving straight into the quality of the blade on this model. But that is actually a little unfair, as DOVO has made a solid effort across the entirety of this design. The handle, for example, is of exceptionally high quality olive wood. Just as with the handle on the last razor from Feather, here that wood handle looks and feels the part. It is comfortable to hold, clearly tough and long lasting and adds a nice weight and balance to the razor. The tang – the piece of metal that connects the blade and handle – is also a little thicker than you will see on some other models of razor. So all in all, a really well designed straight razor with a great feel in the hand. But we know you’re here for the blades, so lets get to that. On the one hand DOVO has gone for a full hollow grind on the blade. That leads to a blade that is finely honed to a very narrow point, providing an outstanding cutting area. Because of the wide area of the grind, it is also a little easier to hone than some other blades. That itself is a great little advantage to this design, resulting in a blade that is not only razor sharp (no pun intended) but is also pretty easy to keep it that sharp too. If we were going to throw any negatives at this razor, it would merely be a warning that this is not a blade suitable for people new to straight razor shaving. It is just too sharp to be used as a learning tool, with an aggressive and pretty unforgiving blade. If you have been using a straight razor for a while though and have your technique down than that is a different story. In that case, it could be well worth your time to check this bad boy out if you are looking for one of the sharpest blades on the market right now, with the power to deliver a closer shave than almost any other razor out there. See what others have to say per the Amazon reviews here. Next up we have a solid example of what is often called a classic shavette straight razor, or sometimes a barber razor. Any man looking for the ease of use and adaptability of a shavette razor. Prepare to have your minds blown, but barber (shavette) razors were invented for barbers. Phew, hope you were sitting down when we dropped that truth bomb. 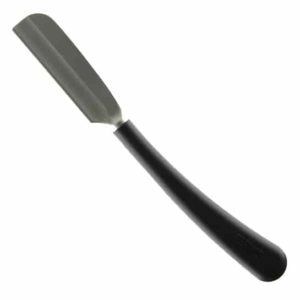 They were invented as a fast and hygienic way for barbers to use a straight razor in their shops. Think about it, the typical barber will see dozens of men every day in his chair. If he is using a traditional straight razor, he has to keep disinfecting it after every use as well as honing it before every customer climbs in the chair. In short it’s a big pain in the backside for him. Enter, stage left, the barber razor, of which this model from Parker is a great example. It has all the benefits of a straight razor in terms of weight, size and hand feel. But it combines all of that with the ease of use of a disposable blade. It’s kind of in the middle between a traditional straight razor and a safety razor – though if anything, it is leaning more toward the straight razor style of design. They are a great tool for personal as well as professional grooming though. For one thing, the cash outlay here is tiny, we’re talking a few bucks to pick up the tool itself. After that, you do of course have to keep buying the blades too but they are literally a few cents each. We really liked this model too, or at least most of it. The arm that holds the blade is stainless steel, not aluminum. That makes it a little heavier, which in turn gives it a nice heft in the hand. It’s also extremely strong and corrosion proof. The plastic handle is… not that great, we won’t lie. It’s not that bad either, it’s perfectly functional, it’s just a little boring. Finally, it should be noted this tool has terrific compatibility with a huge range of single edge blades. This tool comes bundled with some free ones from Shark, so you can try them out first. But you can also pick up blades to fit this machine from just about any manufacturer in the world of razor blades. That’s really cool, as it means you can easily adapt your razor to give the kind of shave you want by selecting more or less aggressive blades. That adaptability is certainly one of the big plus points of this razor blade design. See the collective opinion of over 1,000 Amazon reviews here. Our next product is this, a complete straight razor shaving kit. It is bringing everything you need to start shaving straight out the box, but the key question has to be how good is that razor? 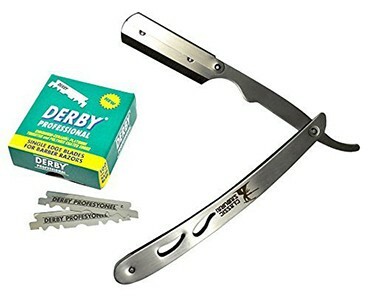 Any man who is a complete newcomer to straight razor shaving and needs to pick all the tools he needs in one convenient package. 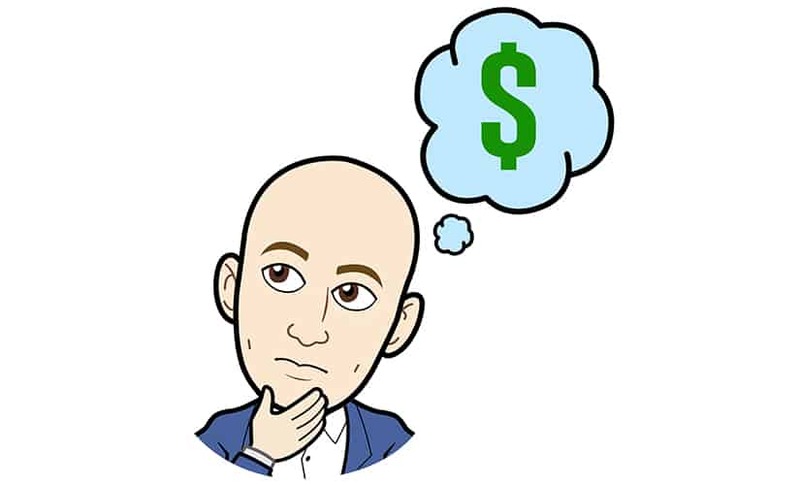 So far, all the products we’ve looked at assume that you have a certain level of products already – or at least are happy to invest in them. The fact is, straight razors cannot work alone. To get the most out of them, they need quality shaving creams and well made shave brushes amongst other tools and items. However if you are new to straight razor use there is a good chance you don’t have any – or at least some – of the extra items you need. Buying all the extra stuff can quickly add up. 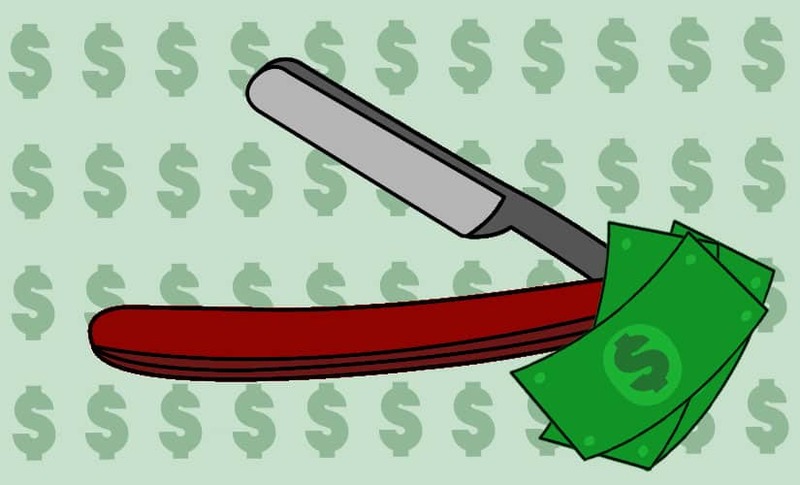 Let’s face it as well, the straight razor itself isn’t exactly cheap. If this is ringing bells with you, then perhaps you could consider investing in this kit from A.P. Donovan. 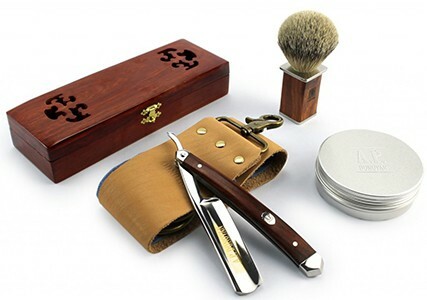 What you get here is a quality shaving brush, a decent shave soap and – most importantly – a honing strap. That is pretty much ticking off all of the most important tools to get started with your straight razor. You also need a straight razor itself, and thankfully you are getting a good quality one here. The blade is a Japanese Alloy, essentially a carbon steel, which is a superb material for blade construction. It’s also a bigger blade than we’ve seen so far with a 7/8” width. In design, this is a nice traditional style of razor. It has a well designed and built wooden handle that has a good balance in the hand. This kit also comes in a very nice wooden storage box. That helps to make it a really good gift too. One issue is that the razor is not shave ready straight out of the box. To us, this is a bit of a shame as this kit is ideal for beginners. It would be helpful to them to have the blade shave ready so they can practice maintaining that cutting edge with the honing strap, rather than having to put the sharp edge onto the blade themselves. Do note – the blade has been ground, so you don’t need to take it to a sharpening shop. 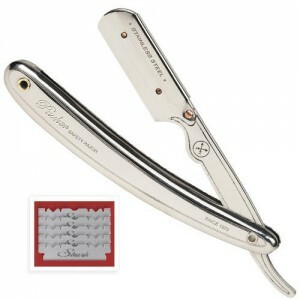 But it is not quite sharp enough to shave with straight away, so you need to work on it with the honing strap first. Still, this is a quality razor backed up with a good array of essential tools all delivered in one convenient package. See the Amazon reviews here. We’ll finish up with this barber razor style tool from Classic Samurai. It is the cheapest tool on our list, but is it bringing anything else other than a bargain price tag? Any man who wants a straight razor shave with a tool that you can buy with loose change down the back of the sofa. If you were to take a straight razor and strip it back to its absolute base components, then you may end up with something a little like this razor from Classic Samurai. It looks like it’s made of bits that fell off of the Terminator’s arm. First off all, great company name, Classic Samurai, great job! Secondly that stripped back design is bringing a number of benefits to this razor. As we alluded to above, this is a crazy cheap razor. It has such a low price tag that we actually had to double-check it with the supplier – we thought they had made a mistake! You are also getting a straight razor that is very simple but also effective. The full construction is stainless steel – no plastic handle here. That gives a product that feels great in the hand with a decent weight. It is also strong, tough and corrosive resistant. That all metal construction makes it super easy to disinfect as well. This is a shavette straight razor too. As with the ones we looked at before then, that means that you can pop in a blade from just about any manufacturer that you can find. That allows you to find a bespoke shave with the razor blade that best suits you, your face and your facial hair. You also get a pack of free blades from Derby bundled here, so you can give them a try. We should point out that the mechanism that holds the blade is not as good here as you will find on some other shavette style razors. It does the job, and it does hold the blade in place effectively, but it is not quite of the quality of more premium razors. There is no tension screw for example. Still, this product will provide a quality shave for a very, very low price. See what other are saying per the Amazon reviews here. If you are going to get the best out of your razor, then you are going to need to not only use it properly – but also hone it. What other tools am I going to need? As we mentioned when we looked at the shaving kit from A.P. Donovan above, there are some minimum tools that you are going to need. At the most basic, you need a quality shaving cream, and remember that if you have sensitive skin, you should be looking for a shave cream formulated specifically for it. Shaving cream lubricates the skin, you cannot shave without it! To us, and we have beaten this drum before, you need a good brush to put that shaving cream on your face. You don’t have to, but it will help! Depending on the type of straight razor you have, you will also either have to invest in a leather honing strap or replacement blades. Beyond those essentials, there are things like skin wash to protect your skin before you shave and moisturizer to help it out afterwards. 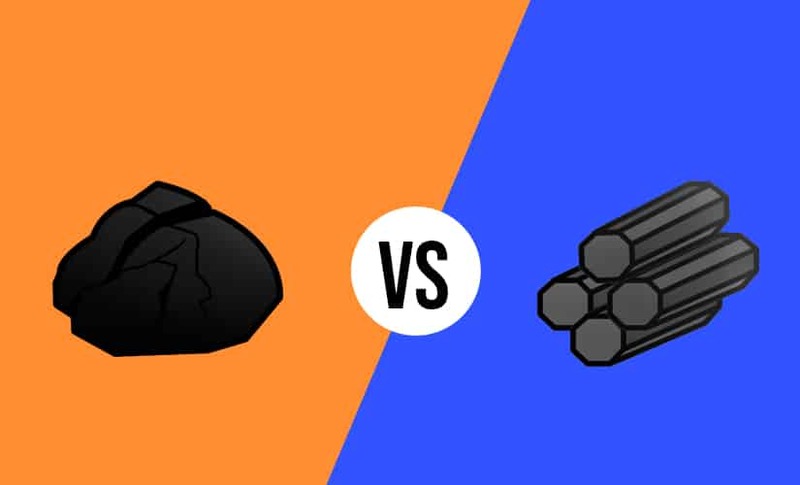 Is carbon better than stainless steel? That is a very loaded question, and it’s kind of hard to answer it really. This is because both materials have strong pros and cons. If you want a very close shave, then look for a carbon blade. Carbon steel is very hard but also brittle. This means that whilst it is able to hold a very, very sharp edge, it also needs a lot of work to maintain that edge. Stainless steel is not quite as sharp but it is much, much tougher. So if the closeness of the shave is the most important, than carbon is the best. If ease of use is your dominant concern, then stainless steel is better. Are straight razors the best razors? This is a very similar question to the one above, at least in terms of how hard it is to answer. Thanks guys, you’re being extra brutal with your questions today! 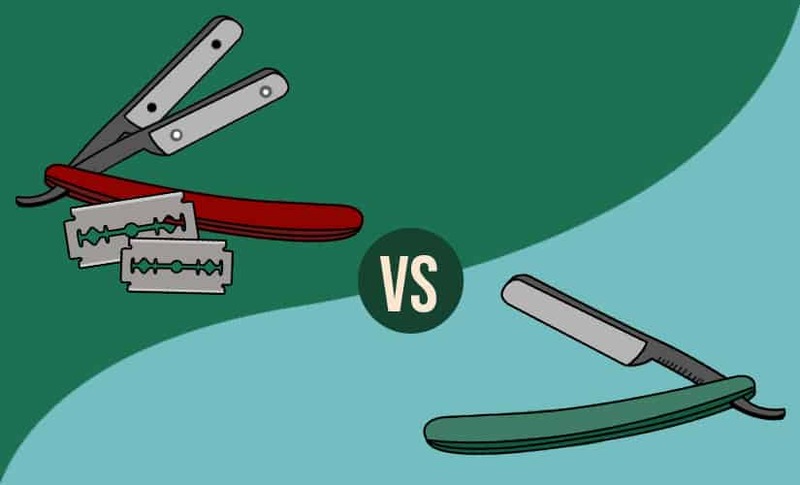 Are straight razors the best? They are best if you are looking for a traditional tool, they are best if you are looking for a tool that can deliver a close shave. On the other hand, if you want a razor that is easy to use, then a straight razor may not be for you. It does take a little bit of practice, and it does require more effort to use than with a standard safety razor. In the best world, you could look using several types of razor. The straight razor on days when you have a little more time. The safety razor for rapid grooming in the morning before rushing out to work. Many of us are not taught how to shave properly, are we? With cartridge razors you can kind of get away with a poor technique with the aid of a roll of toilet paper, but that is not going be good enough with a straight razor. 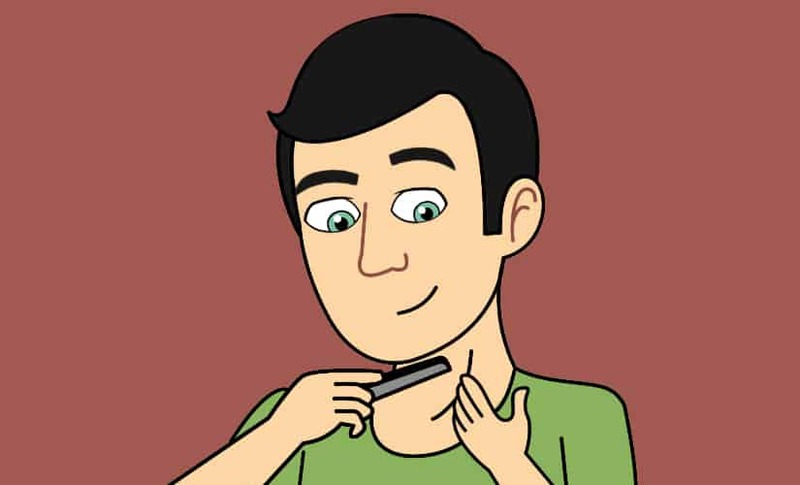 Here is a step-by-step instruction on how to shave with a straight razor. The first thing to do is to ensure that your razor is as sharp as possible. For a barber style (or shavette) razor, that just means replacing the blade frequently. For a traditional razor though you will need to strop and hone the blade. Stropping is done with a leather strap, honing is done with a wet stone. There are a number of guides to how to do this essential maintenance properly. The next stage is of course lathering up. There is no special way to lather up for a straight razor. Just get your brush and your cream, work up a good lather and apply it to you face, working in a circular motion to lift each hair. Holding a straight razor is a little like holding a pen, in that everyone has their own style of grip and finger placement. 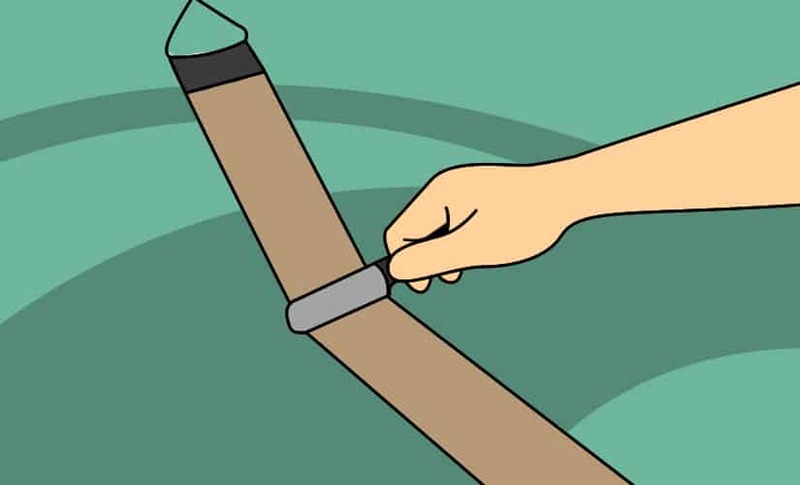 What we would see as the default position is to place your first three fingers on the top of the blade and your thumb on the opposite side in the middle. Your little finger goes onto the tang and you essentially “pinch” the razor blade. Don’t rush your strokes, especially when you are learning the technique. Always stroke in a downward direction, and you will get the most effective shave if you work in a set pattern. Start at the cheek, run down to the jaw line and down the neck. Do your chin next and finish with the area around your mouth and under your nose. Repeat on the other side of your face and you’re all done! Just started shaving with a safety razor, I use the Parker SRX. This thing is all stainless and heavy duty, I love it. But it has shark blade which after two shaves the blades start to nick a lot. I love the Dovo. 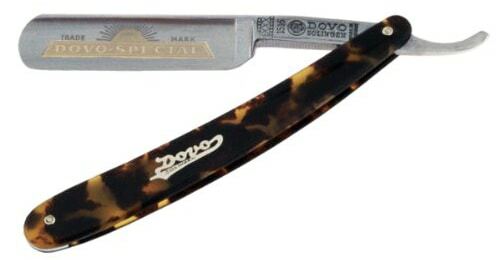 I tend to get all of my Dovo razors from West Coast Shaving – they have a great selection. The Feather blades are also pretty good. One that is not on this list that I enjoy is the Artist Club straight razor, one of the best I have had. I can’t see getting more than a cut worthy of stitches at the most from bad razors. I use the Feather Artist Club SS (Folding Style). This is the Absolute best ergonomic feel, weight, and shave I’ve ever had as far as Shavettes. The construction has been thoroughly thought out and beautifully designed and crafted. Uses very high grade materials! Gets a 10 out of 10 from me. Thanks for the suggestion Aaron!